From August 28th to August 31st 1,280 exhibitors over 14 exhibition halls impressed visitors with a full range of bike products. The show was opened by the German Chancellor Dr. Angela Merkel, a visit which highlights the German government commitment to the bike industry. E-bikes received a special mention by the Chancellor. 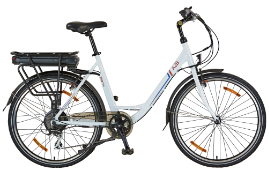 A2B was widely recognised as a leader in the e-bike sector and the supplier of choice for premium e-bikes. The A2B collection of Pedelecs and e-bikes were on display in the Zeppelin Hall. Set against the magnificent backdrop of the Zeppelin NT, dealers, distributors and enthusiasts from all over the world were able to view and test the A2B models. Feedback from test riders was very positive. It was not only the extraordinary design that caused a stir, but the ride quality of the bikes. "That's fantastic!" said a visitor after a long test drive with the new model Obree. Especially popular was our ExtraEnergy awarding-winning Shima, a model that was constantly in demand on the test track. Comments from test riders included "This is amazing", and "Incredible”.